MANAGE - Reds play 32 (1242 in SSG but one CB has stepped in).Red player in centre circle acts as feeder and extra option but must stay in circle before progression. Limited to two touch to ensure realism and tempo. Blues to defend goal and limit shots and goal scoring opportunities. Can they make three passes and score in mini goals (Blue attacking players) on change over of possession within 10s. Reds to work ball and score through central areas initially -double points if so. Let play for 45s to let session breathe and observe/diagnose (guided discovery). Blues coached to deal with problems that Reds pose. At all times consider the positions of the remaining defenders/midfielders and GK. Reds must attempt to hit strikers directly by spliting twin screen. Red midfielders to split wide when feeder gets ball. Tell Red strikers to stay high and only move behind screen for now. 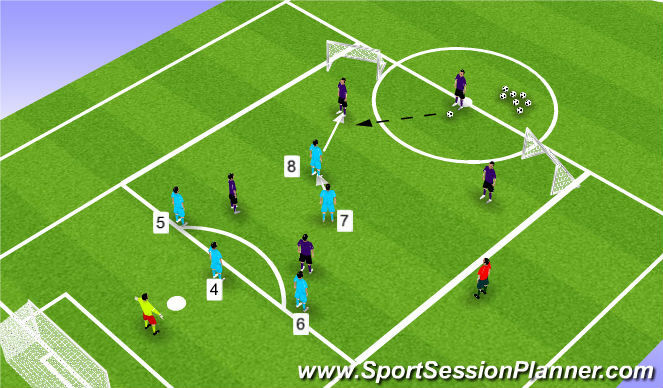 Twin screen to work closely together to protect defence and cover/balance if one presses ball. When feeder has ball they stay central in a low block (coach&apos;s descretion - must give opposition a chance to play ball) and then go left/right dependent on pass. #7 to drop at 45 degree angle (just not flat!) and then visa versa if midfield switch ball. Encourage negative pass (sideways or backwards). 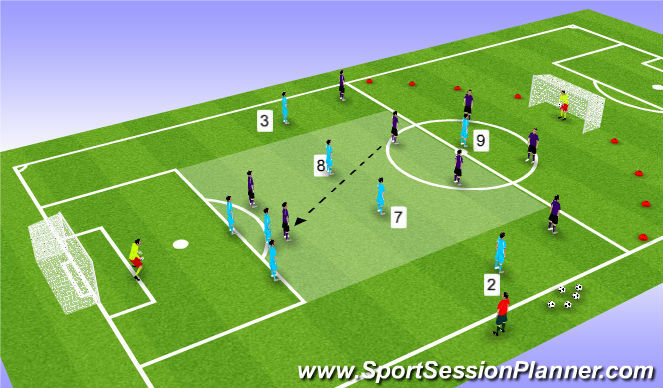 As ball travels across to opposite midfielder then #7 and #8 alternate roles. eg. DETAIL - What? pressure on ball, Who? nearest to ball, When? as the ball travels to opposition, Where? wherever opponent is, How? fast, slow, low, aggressive, force negative pass, Why?stop him playing forward and not give him time on ball. If ball is central can the whole unit be compact centrally (width of 6 yard box?) ready to shuffle right or left. Numbers 4,5,6 to stay within width of 6 yard area initially (8-10 yards max between). Don&apos;t leave too big a gap between 3 CBs and midfield unit. Defence not too high to leave space in behind. Ensure GK is not on his line and occupying area near penalty spot when function starts and in line with ball at all times. Defenders man mark and one spare. Also the whole unit moves across as one leaving furthest players away unmarked if necessary.Try and force the opposition to play around them (long way around) and not through them (angles and distances of unit). What if ball is played through after coaching screen? On turn over of possession can Blues, using attacking principles such as, width and depth, good quality of passing, angles and distances of support, body position and first touch, movement to receive and support play and decison making, score in mini goals. Feeder steps in as extra player to create overload in midfield once he&apos;s played first pass. Ensure midfielders split wide enough to allow more time on ball. Reds instructed to go around twin screen and pass ball into wider areas. Ensure balance of attack in case it breaks down (can&apos;t all attack!). Tell strikers to make better runs behind screen and midfielders to keep possession until opportunity to pass comes (around or through). Double points if go around unit (midfield 2 and back 3). Blues shuffle together as unit remaining compact, always leaving the furthest player away unmarked. If play is then switched, during the flight of the pass, the Blues must quickly shuffle to prevent the Reds having a player free on opposite side of pitch. Communication is key (When to press and when to shuffle). Ensure back 3 is not too high and GK is playing as sweeper keeper (limit space for strikers to run into). Eventually ball be played through or around screen (3v2).Already coached screen therefore focus on rest of unit. Is there pressure on ball? Can they intercept? tackle? show away from goal? Spare CB to track runners, intercept, pick up through ball. What if CB is beaten out wide? Can he block cross? Can other defenders and screen shuffle, fill in/cover? If strikers switch then CBs pass man on don&apos;t follow man. Must communicate. What if both strikers go to same side? CBs man for man with furthest CB free to sweep or stop switch. eg. DETAIL - What? Pressure on ball, Who? Nearest CB, When?as ball is travelling if it goes passed screen, How?Fast, tight, aggressive, Why?stop striker turning and shooting, playing through ball or space to dribble into. Twin screen to track back and press from opposite side. Be ready (half turn) for quick counter. Ball Starts with Red team GK. Normal rules apply but no free kicks/penalties. 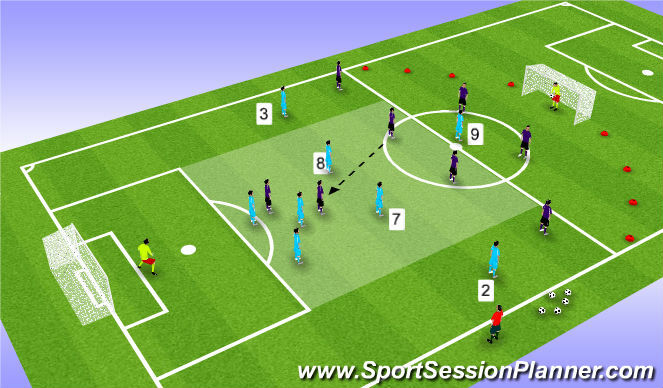 Defensive unit (3-2) are to implement what they learnt from the function. 2/3 pitch and tapered in where Red fullbacks and Blue attacking wide players would normally be. Reds get double points if they score through the central areas (ie. back 3 and twin screen) or wide areas. Can Reds play through to strikers? Around and into chanels to strikers? Can Blues defend it as coached in function? Coach more around and away from ball as more team players involved now (eg.wide players and striker). 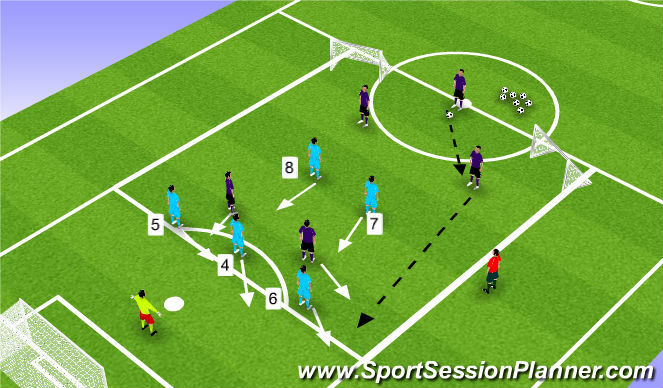 #8 #7 screen pass into central strikers but must press ball in middle too. Full backs to be compact. If ball is played centrally into striker then back three must be very narrow. One presses player and other two cover in behind (triangle/pincer). Try not to get sucked out of postion too much as this leaves 2 defenders to defend width of pitch. Sometimes twin screen have to drop into defensive line if players are out of position. CBs must also shuffle across if striker pulls wide or if play is on that side of pitch. If wide player gets beaten then CDM to press player with the ball and the wide player then to recover and take up CDM position OR centre back shuffles across (whoever is closest). When defending #2 #3 should tuck in to make midfield compact but aware of opposition wingers and track winger if he runs in behind. Must press wide midfield players and not sit too deep and invite pressure (if #3 presses wide player then #2 tucks in centrally open body so he can see his opponent). If #3 in more defensive position pressing then #2 drops into a more defensive position in back line (open body to see what&apos;s behind him). Be aware of red wide attacking player. If opposition winger cuts inside with ball blue player follows to stop overload (man mark). Blue striker needs to stay high to offer depth and occupy two red defenders. Attempts to defend from front where possible but no further than centre circle (My discretion in game).Occupies half of pitch where ball is and can attempt to force ball back to GK. Formation change to 2411. Red #10 drops deep to find space. Ball played into #9 feet more often as a result either directly or indirectly as reds have overload in central areas. If #10 drops further than twin screen then the midfielders must deal with it. Similar to function when Red CB steps in. Closest wide player to tuck in to lessen threat of overload but also be aware of opposition winger. If #10 drops centrally but not passed screen then one CB must press to protect middle of pitch and other two CBs narrow up behind (diagram SSG 1). Timing is crucial - ensure other CB has dealt with other striker then central CB engages. Shouldn&apos;t engage too early as leaves big gap behind him-needs to assess quickly (communication). Midfielders also press from behind. If ball goes into striker in wider area then nearest CB puts pressure on ball and other two cover and balance on inside shoulder of presser. Long ball over top - dont play too deep to allow too much space for strikers to turn and run into or at defenders. Win ball in air. Don&apos;t let ball bounce.If so win second ball. Shot from distance - GK to be on toes, in line with ball, push ball away from goal. If ball is spilt defenders to be ready to win loose ball. Last 2 mins scenario - 1-0 up in Champions League Final. Opposition throw everything at them.Can they hold tight? Can they counter quickly?